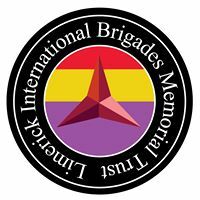 The Limerick International Brigades Memorial Trust is made up of a number of people of different backgrounds and interests. We are a cross-section of people drawn from the business, trades, academic and political worlds. The Memorial Trust was established for the express purpose of remembering and honouring the memory of the five Limerick men who fought with the International Brigade in the Spanish civil war. . These men went to Spain of their own free will to fight for what they believed to be a moral principle. They were not motivated by money or greed but by their faith in humanity and their love of freedom and democracy. They went to fight for a better world-a world of justice ,morality and decency. Their collective and individual contributions in the cause of democracy and freedom have been widely recognised elsewhere and we believe it just and proper that they be celebrated where they were born and reared. Limerick has cause to be proud of their respective roles and our intention is to commemorate them by erecting, in a public place in the City, a fitting tribute to their memory. 76 years ago over 40,000 men came from all over the world to fight in the International Brigades during the Spanish Civil war, in defence of a democratically elected Government. Of these about one third were killed and many others permanently injured. The vast majority went to Spain of their own free will to fight for what they believed to be a moral principle. They overcame enormous difficulties to fight for the Republic. They were not motivated by money or greed but by their faith in humanity and their love of freedom and democracy. They went to fight for a better world – a world of justice, morality and decency. 5 Limerick men fought with the XV brigade Frank Ryan, Jim Tierney, Joe Ryan, Gerrard Doyle and Jim Woulfe– who died in the battle of Belchite in 1937. The dangers of fascism racism, xenophobia & homophobia must not go unchallenged and should be confronted wherever they exist. Let’s make Limerick a symbol of hope. A city to be proud of in its promotion of these ideals. A city of tolerance where these dark values have no place. This monument should be used as a vehicle for change. We propose to dedicate this memorial to these ideals of courage and vision. We want people to act like the Brigadistas and help break down the barriers of hatred and racism. Surely there can be no more honourable enterprise than to go voluntarily to foreign parts, ready to sacrifice your own life to defend the freedom of others. To risk everything to counter the darkness of fascism, and confront it wherever it exists because it is an affront to all civilised people. Please pass this message on to your friends. We hope to start a fund raising drive in the new year so all help or ideas will be gratefully received.